Toronto comic-book writer Steve Murray is stepping up to the plate to reboot an iconic, web-slinging superhero. Toronto comic-book writer Steve Murray is feeling the pressure. When friends and acquaintances found out he had been asked by Marvel Comics to write a new Spider-Man comic book, he was flooded with calls. "People were being like, 'Are you going to do this? Are you going to do that?'" he told Matt Galloway on CBC Radio's Metro Morning. 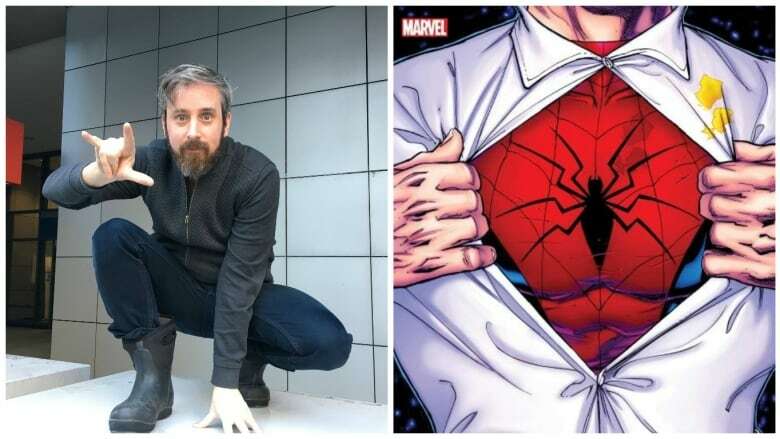 Murray, who writes comics under the pseudonym Chip Zdarsky, said that although the expectations of fans weigh heavily on him, he's trying to treat it like any other job. "The work is still the same, I still go out to my garage every day and start typing by myself like a lonely man," he joked. Though Peter Parker's recent storylines in the Amazing Spider-Man comic-book series have seen him travelling the world and making millions of dollars after starting a company, Murray's job is to bring him back to more familiar terrain. "[They] tasked me with planting him back in New York and having a bit more of the kind of hard luck Spider-Man storyline," he said. As for what that hard-luck storyline will look like, a single image has been released from the upcoming book: Peter Parker ripping his shirt off Superman-style, costume underneath, with a distinct mustard stain on his chest. "There's a surprising amount of freedom" to work, said Murray. He was asked by Marvel to take on the iconic character after writing other Marvel characters like Howard the Duck. The new comic book, to be called Peter Parker: The Spectacular Spider-Man, will come out in June, shortly before the premiere of the latest movie in the franchise, Spider-Man: Homecoming.